All transactions are safe and secure with a reliable history in online purchasing behind each of our associates. 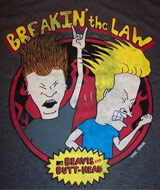 Buy the Breaking the Law shirt to own Beavis and Butthead clothing and merchandise. As any fan can attest, Beavis and Butthead shirts rock and this one is no exception to the rule. It features the line "breaking the law" from the Judas Priest song of the same name that they start singing anytime they are up to no good. If you like watching them break the law, then pair this tee with a Beavis and Butthead Cornholio shirt today. In addition to the Breaking the Law tee above, browse the Beavis and Butthead Clothing Gallery for more apparel like men's and women's clothes, kids shirts or hoodies.